Do you like Dividends? I do and you should love them too. Dividends are paybacks to shareholders, money that you can use for reinvestments or your daily spendings. But the dividend is not everything you need to look on when you think about investments. It doesn’t make sense to buy a high yielding stock with high debt and no growth perspectives. Inflation will destroy your investment in the end. One very successful investor who has been focused on dividend growth investing is Warren Buffett. I don't recommend covering his investments but Warren has a great idea base for us normal investors from that you can also benefit. His latest SEC-Filling shows that he has assets which are worth over $100 billion. Around 43 percent of his money is currently invested within the financial sector. Below is a small overview about his latest dividend buys. Seven of his ten most recent purchases pay a dividend. The best yielding pick was General Electric with a 3.42 yield. The biggest impact had the Goldman Sachs (GS) transactions with a 2.14 percent change result to his portfolio. 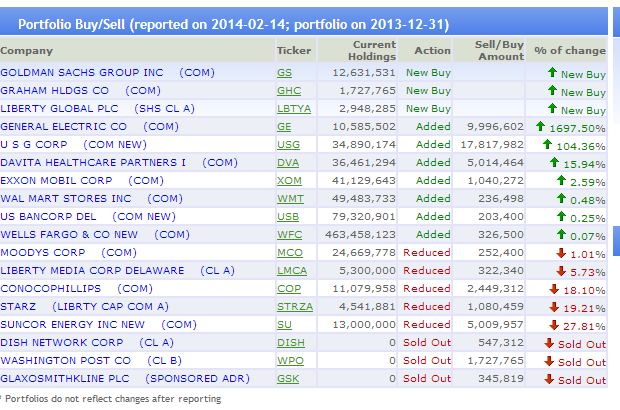 Nearly of Warren's latest buys are cheaply priced measured by a forward P/E of less than 15. 4 stocks still dominate his asset allocation: Wells Fargo (WFC), Coca Cola (KO), American Express (AXP) and finally IBM (IBM). Each of them has a 10+ percent share in his portfolio. It's a clear signal to buy only those stocks that underlying business you understand. General Electric (NYSE:GE) has a market capitalization of $260.42 billion. The company employs 305,000 people, generates revenue of $146.045 billion and has a net income of $15.475 billion. General Electric’s earnings before interest, taxes, depreciation and amortization (EBITDA) amounts to $26.267 billion. The EBITDA margin is 17.99 percent (the operating margin is 17.99 percent and the net profit margin 10.60 percent). Financial Analysis: The total debt represents 58.33 percent of General Electric’s assets and the total debt in relation to the equity amounts to 291.25 percent. Due to the financial situation, a return on equity of 11.93 percent was realized by General Electric. Twelve trailing months earnings per share reached a value of $1.49. Last fiscal year, General Electric paid $0.76 in the form of dividends to shareholders. Market Valuation: Here are the price ratios of the company: The P/E ratio is 17.31, the P/S ratio is 1.78 and the P/B ratio is finally 1.98. The dividend yield amounts to 3.42 percent and the beta ratio has a value of 1.65. Exxon Mobil (NYSE:XOM) has a market capitalization of $411.12 billion. The company employs 76,900 people, generates revenue of $438.255 billion and has a net income of $33.448 billion. Exxon Mobil’s earnings before interest, taxes, depreciation and amortization (EBITDA) amounts to $57.711 billion. The EBITDA margin is 13.17 percent (the operating margin is 13.17 percent and the net profit margin 7.63 percent). Twelve trailing months earnings per share reached a value of $7.37. Last fiscal year, Exxon Mobil paid $2.46 in the form of dividends to shareholders. Market Valuation: Here are the price ratios of the company: The P/E ratio is 12.77, the P/S ratio is 0.93 and the P/B ratio is finally not calculable. The dividend yield amounts to 2.68 percent and the beta ratio has a value of 0.70. 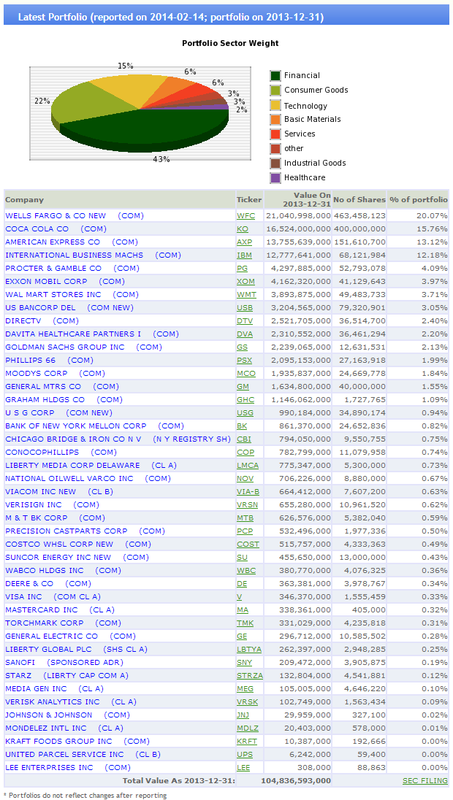 Wells Fargo (NYSE:WFC) has a market capitalization of $242.51 billion. The company employs 270,600 people, generates revenue of $47.089 billion and has a net income of $22.224 billion. Wells Fargo’s earnings before interest, taxes, depreciation and amortization (EBITDA) amounts to $37.085 billion. The EBITDA margin is 44.25 percent (the operating margin is 38.93 percent and the net profit margin 26.52 percent). Financial Analysis: The total debt represents 13.55 percent of Wells Fargo’s assets and the total debt in relation to the equity amounts to 121.59 percent. Due to the financial situation, a return on equity of 13.99 percent was realized by Wells Fargo. Twelve trailing months earnings per share reached a value of $3.89. Last fiscal year, Wells Fargo paid $1.15 in the form of dividends to shareholders. Market Valuation: Here are the price ratios of the company: The P/E ratio is 11.86, the P/S ratio is 2.89 and the P/B ratio is finally 1.58. The dividend yield amounts to 2.60 percent and the beta ratio has a value of 1.44. Wal-Mart Stores (NYSE:WMT) has a market capitalization of $245.24 billion. The company employs 2,200,000 people, generates revenue of $469.162 billion and has a net income of $17.756 billion. Wal-Mart Stores’s earnings before interest, taxes, depreciation and amortization (EBITDA) amounts to $36.302 billion. The EBITDA margin is 7.74 percent (the operating margin is 5.93 percent and the net profit margin 3.78 percent). Financial Analysis: The total debt represents 26.65 percent of Wal-Mart Stores’s assets and the total debt in relation to the equity amounts to 70.91 percent. Due to the financial situation, a return on equity of 23.02 percent was realized by Wal-Mart Stores. Twelve trailing months earnings per share reached a value of $5.20. Last fiscal year, Wal-Mart Stores paid $1.59 in the form of dividends to shareholders. Market Valuation: Here are the price ratios of the company: The P/E ratio is 14.59, the P/S ratio is 0.52 and the P/B ratio is finally 3.29. The dividend yield amounts to 2.48 percent and the beta ratio has a value of 0.41. U.S. Bancorp (NYSE:USB) has a market capitalization of $74.44 billion. The company employs 64,486 people, generates revenue of $12.285 billion and has a net income of $5.732 billion. U.S. Bancorp’s earnings before interest, taxes, depreciation and amortization (EBITDA) amounts to $9.107 billion. The EBITDA margin is 47.00 percent (the operating margin is 40.07 percent and the net profit margin 29.58 percent). Financial Analysis: The total debt represents 13.09 percent of U.S. Bancorp’s assets and the total debt in relation to the equity amounts to 115.92 percent. Due to the financial situation, a return on equity of 15.73 percent was realized by U.S. Bancorp. Twelve trailing months earnings per share reached a value of $3.00. Last fiscal year, U.S. Bancorp paid $0.88 in the form of dividends to shareholders. Market Valuation: Here are the price ratios of the company: The P/E ratio is 13.58, the P/S ratio is 3.84 and the P/B ratio is finally 2.05. The dividend yield amounts to 2.26 percent and the beta ratio has a value of 0.95. Graham Holding (NYSE:GHC) has a market capitalization of $4.86 billion. The company employs 17,000 people, generates revenue of $3.995 billion and has a net income of $50.08 million. Graham Holding’s earnings before interest, taxes, depreciation and amortization (EBITDA) amounts to $546.11 million. The EBITDA margin is 13.67 percent (the operating margin is 3.66 percent and the net profit margin 1.25 percent). Financial Analysis: The total debt represents 13.65 percent of Graham Holding’s assets and the total debt in relation to the equity amounts to 26.83 percent. Due to the financial situation, a return on equity of 1.89 percent was realized by Graham Holding. Twelve trailing months earnings per share reached a value of $11.79. Last fiscal year, Graham Holding paid $9.80 in the form of dividends to shareholders. Market Valuation: Here are the price ratios of the company: The P/E ratio is 55.86, the P/S ratio is 1.22 and the P/B ratio is finally 1.89. The dividend yield amounts to 1.55 percent and the beta ratio has a value of 1.13. *I am long GE, WMT. I receive no compensation to write about these specific stocks, sector or theme. I don't plan to increase or decrease positions or obligations within the next 72 hours.